My name is Merlijn (Boris Wolf) Wajer; born in Amsterdam, 16 December 1990 I am 22 years old and currently attend the University of Amsterdam, currently going for my Master of Science in Computational Science after finishing a Bachelor of Science in Computer Science. My Curriculum Vitae (detailed contact info removed). I'm generally very open to all kinds of (weird|cool) questions, so please do not hestitate to contact me. I regularly assist courses at the University of Amsterdam since 2009. If you're a student, please don't hesitate to drop me an email. My web log can be found at http://blog.wizzup.org I try to post there regularly, but so far that has not worked out. I have a partiular interest in tools that empower activists. As of 2013, I am active in the Hart voor internet vrijheid foundation dedicated to fight censorship on the internet. If you know of any interesting problems or projects, please do let me know. Recently I have also gained interest in the Tor project and hope to contribute in the near future. Aside from Computer science activism, I also consider myself a Militant Atheist. I like messing around with Linux. In particular I've had a lot of fun with my sheevaplug(s) running Gentoo Linux. These days I use a Samsung Chromebook running Gentoo Linux as my main machine. As for sports; I've been practicing Aikido since I was a child, with a few pauses. I also like reading and music: Ambient, Classical, New Wave, Black/Viking Metal. Some of my projects will be quickly covered here, all my other small projects can be found on "Het Grote Bos", the umbrella project for much of my projects, or alternative on one of my git hosts, git.wizzup.org and my Github account. Tracy is a cross architecture System call tracing and injection framework for Linux (*BSD support will hopefully follow). neversearch is a simple but powerful program that allows you to assign tags to files or directories, if your file system supports xattr (eXtended ATTRibutes). This can make your life a lot easier when managing photos or other files. There are many possible uses cases, see the neversearch page for more info. Creating a mouse from joystick input. Combining or splitting input devices. Immature project, but works for my use cases. I mostly created this for an arcade machine that exposed two joysticks as a single keyboard device. 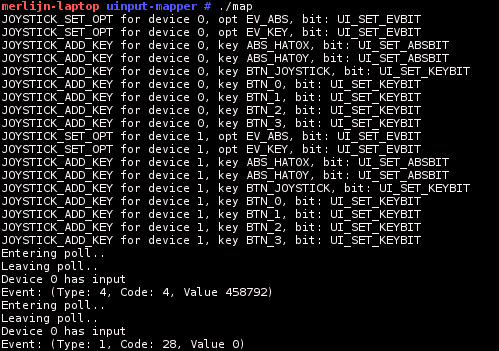 /dev/input before the map program is running and while the map program is running. Rubberfuse is a continuation of the work done on Rubberhose-FS by Julian Assange et al. We're still in the planning phase. 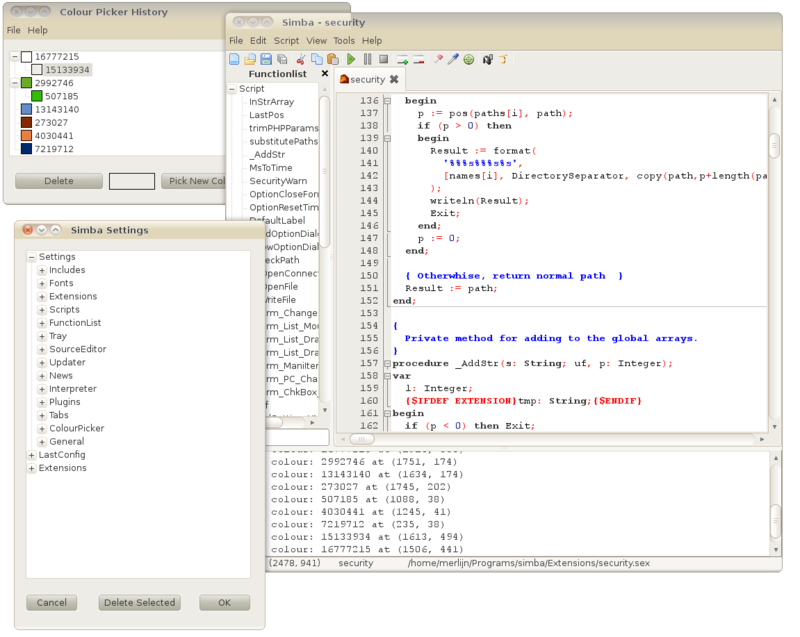 SRL is the first project I ever participated in and it has mainly been the base of my current programming knowledge. SRL was initially a library created to macroing a game called Runescape, but has since turned into a community full of interesting people, talented programmers and generally cool fruitcakes. The library still works, by the way. SRL has lots of Scripts that each perform their own task on Runescape. SRL is interpreted by a program called Simba, created by members of the SRL community. Simba. Simba can perform many kind of tasks, including faking mouse movements and key presses, finding bitmaps and colours and reading text from the screen. Simba is GPL-3 licensed and Open Source and Free Software. Simba running on my old Linux distribution, Ubuntu Linux. SRL-Stats was created to keep track of the progress and use of SRL. SRL Scripts can gather statistics from their actions and submit them to SRL stats. 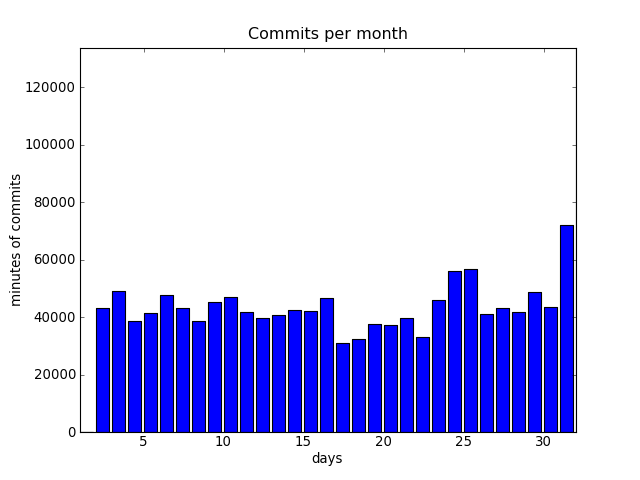 Currently the most popular script has ran for 954 days, 8:49:00 with 154756 individual commits., which is pretty impressive. The SRL Stats website as on http://stats.villavu.com. The design was taken from some free templates site, as I stink at web design - at least for now. An example of a graph generated by SRL stats, this is of the fifth month of 2011.
πϱTorrent is a web interface to rTorrent. It was written in Python because I got so fed up with all the crappy PHP interfaces and generally just PHP being crappy. It is still work in progress, but it can do some basic stuff like list and add torrents, connect to multiple rtorrents at once, manage users, basic login authentication. Oh, and πϱTorrent is really fast compared to any of the PHP web interfaces. The not so minimalisitic PDF viewer. Least is a very simple OpenGL based PDF viewer. We have some great features we wish to implement, but so far I have not found the time. Simple Noise Activated Recording in Python. SNARP is a noise activated audio recording program. 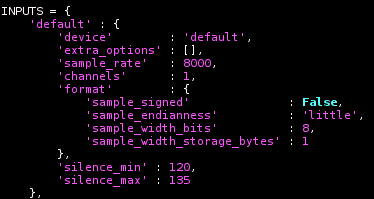 I initially wrote this for the Nokia N900, but it should work on most Linux desktops. DCS was an assignment for the University of Amsterdam, we had to form groups and implement a chat protocol similar to IRC. Our implementation ended up being quite cool, with only one known bug. One that we've never bothered to fix, though. 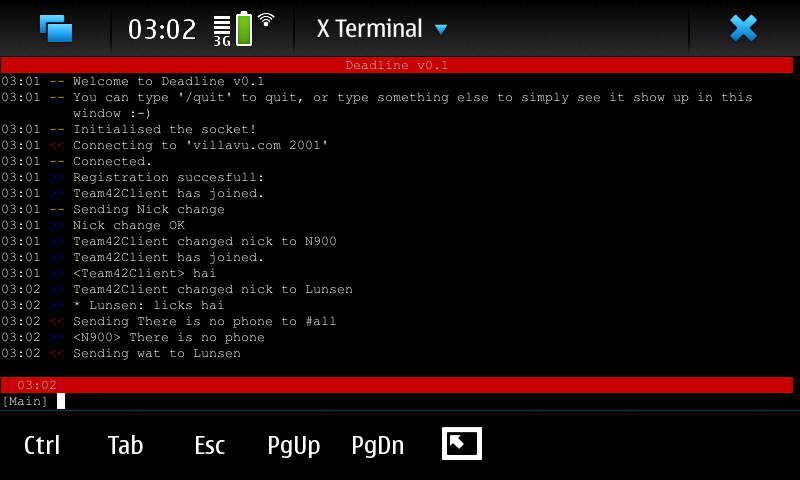 The DCS ncurses client running on my Nokia N900.